How to get my solar sign and decan ? You have an astrological sign at birth by the position of the Sun in the zodiac (angular distance between the center of the sun and the gamma point, degree 0 of the zodiac). Dates found in forecasts horoscopes are rough because Sun's position only depends on seasons and not on the civil calendar. That's why, every year, the dates of the signs change by a quarter of a day. Same thing for decans that give details about the position of the Sun in the sign every 10 degrees. In order for you to know precisely about your sign and your decan, especially if you were born at the beginning or the end of a sign (around the 21st of each month), you need to calculate your precise Sun sign position. That's the only way to have true details about your sign and decan. Decan's information is also printed on any birth chart, following the degree of the Sun ( ): from 0 to 9°59 for the first decan, from 10° to 19°59 for the second decan and from 20° to 29°59 for the third. 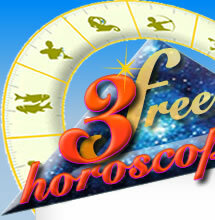 Click here to calculate your sun sign and decan.